Oh, letterpress! Where to begin? Hands down, my all time favorite printing technique. Just unbelievably beautiful. Elum Designs, Hello, Lucky, Peculiar Pair Press and Spark are among my favorite design studios. Letterpress involves raised lettering on metal plates. This is the opposite of engraving. Think, typewriter keys. Ink is applied to the plates and then the plates are pressed into the paper. This causes the ink to rest in the indentations on the paper's surface. The result is irresistible. 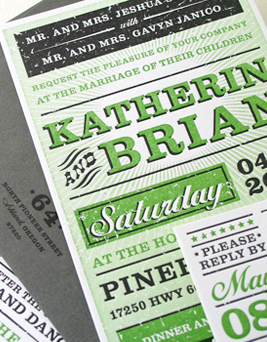 Today's letterpress trends mix the sophisticated beauty of tradition with fresh design. Look for unusual color combinations and bold designs that make an unforgettable statement. Sadly, all that beauty comes at a terrible (read terribly high) price (sad flute). Letterpress is just about as expensive as you can get. Again, the hand-made nature of the product contributes greatly to it's price tag. Turnaround is typically 4 to 8 weeks. It's totally worth the price. And the wait. Believe me. The savvy bride can follow the same cost-saving tips as engraving and it should bring the price down a bit. This is the "Poster" invitation from letterpress giant, Elum Designs. People, I have held this delicious invite in my hands and if I could eat it to gain its tremendous beauty, I would. That. Amazing. I dare you: go to that website and NOT fall in love. Style, design, pizazz-a perfect 10. Meow! Well, that's it! A crash course in printing. Whew! I'm so proud of you for sticking with me. Now, I've had a lot of requests for some info on pieces in an invitation suite. Should we discuss? 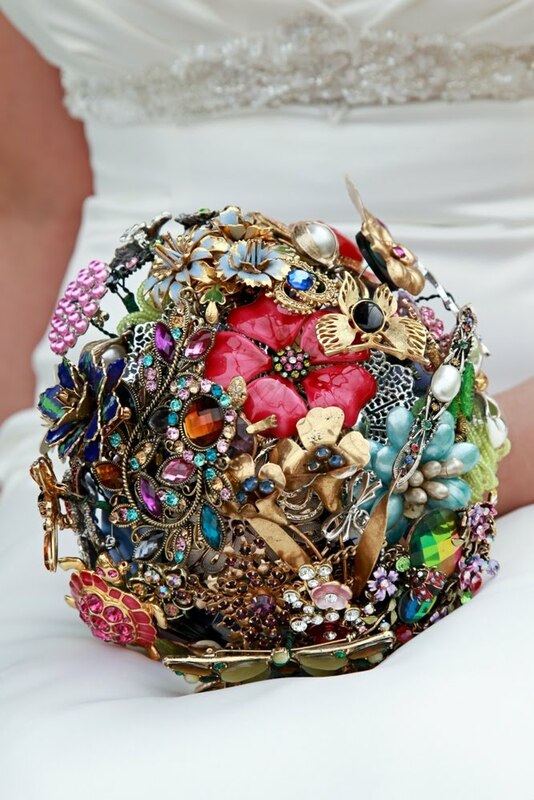 ...showing you another fantastic brooch bouquet! Okay, here is another unbelievably beautiful example of what you can do with color and theme. This yummy creamy palette is one of my favorites this year. I think the depth and texture of this particular bouquet would be perfect for a romantic, lush fall or winter affair! 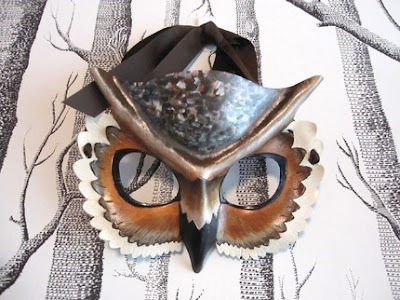 Look at this fantastic owl mask from Etsy seller, Sundries and Plunder. The shop is seriously fantastic. Go. Check it out. You're Invited Part 3: Lithograph-what?! This is a standard technique used for most printed material. Maps, books, sheet music, the sky's the limit! An inked image is transferred (or "offset") from a plate to a rubber blanket, then to the printing surface. When used in combination with the lithographic process (which is based on the repulsion of oil and water) the offset technique employs a flat image carrier on which the image to be printed obtains ink from ink rollers, while the non-printing area attracts a water-based film, keeping the non-printing areas ink-free. Neat, huh? I think so! This process allows for the most flexibility in color palette and design. A smart and well executed design can make offset invites look even more beautiful. The Wiley Valentine design team uses a combination of offset printing and letterpress grade papers to achieve stunning design. Offset printing is best left to commercial printers and design professionals. Lithography is the least expensive printing technique and has the fastest turnaround. You'll have to check with your designer and/or printer to get the exact lead time, but I've seen some come in under two weeks. This is the lovely Adam Scott invitation by Wiley Valentine. Totes brill! If I could, I swear to Lady Gaga I'd have them design my life. Oh, by the way dolls, they have a blog too. Seriously, check it out. Good Morning! I promised you more on invitations and here it is. Thermography achieves a look that is similar to engraving. The process used to create it is much less labor intensive. The card stock is run through a printing press. The ink is then sprinkled with a powdered polymer. The paper is then heated, causing the polymer to melt and raise, giving the appearance of raised ink. The only noticeable difference from engraving is the absence of the bruise. Also, Thermography dries with sheen whereas engraving dries matte. The ink has a tendency to be slightly more transparent than engraving inks. With the higher end thermographers the differences are virtually undetectable. Because of its machine made beginnings, thermo is a much less expensive alternative to engraving. The difference in price is typically 10-20%. However the dark paper/light ink combo is out (boo). The extreme heat just doesn't allow it. Turnaround is shorter than engraving, clocking in at 2 to 4 weeks. This little beauty is part of the exclusive Thermography Collection available at Wedding Paper Divas Online and designed by William Arthur (ooh, la la!). I encourage you all to get a load of the fantastical and affordable offerings. I love, love LOVE, them! If I was getting married again, I would totes rock the look. Instead, I'll be weaving it in to some of my signature designs (more on that later, y'all) and it will be an À la carte service that we will offer here at Goldiluxe (ooh, more on that later too...I am all about the secrets today). Here are some of my favorites! This beauty is from Studio del Fiore in beautiful Portland, Oregon. I. Die. 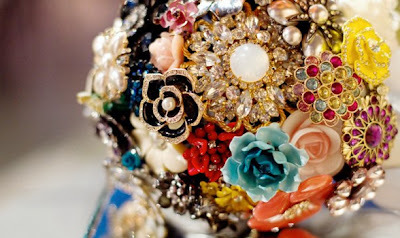 Notice how the design is based around a central floral theme and is expanded upon by the more suggestively floral pins. The explosion of color adds major depth and drama to this piece. This swoon worthy piece is from one of my favorite photo shoots of the year. Couldn't you just die of the genius?! 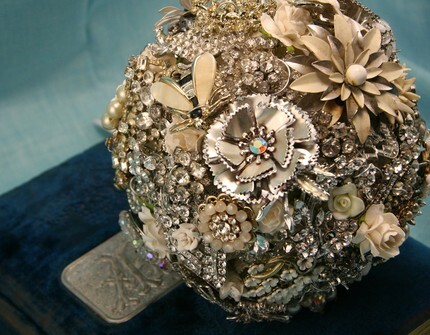 When I first started getting into this type of bouquet, I saw a lot of collared styles. How refreshing to see something like this. So spectacular. So beautiful for so many reasons. This piece by Amanda Herr. I like the use of color here to capture a moody beauty. Exploring the moody side of love and happiness is a theme I adore. Bright beautiful color with a touch of whimsy. Who could ask for more? I am dying over that little frog brooch. I'm enjoying the playful nature of this bouquet. Another Amanda Herr design is a total hit with me! By the by, this design mastermind also has an Etsy shop, so get over there and check it out! Considering a beauty like this to call your own? Who wouldn't be after seeing some of the best out there? My advice to you is to treat this like any other aspect of your big day. Work with someone you trust, who can bring your vision to life. Edit, edit, edit. Also, while these little honeys are a bit pricey ($250-$500, depending on the artist/designer) you may be able to bring the price down if you can provide your own brooches. This is also a great way to have a little more control as far as theme and mood. Besides, who doesn't love weaving through antique stores, hunting for jeweled lovelies? I hope you're having a lovely week. All's well in MKE! Just wanted to let you know, Goldiblog has a new address! Capisce? So, change it up, y'all! You aren't going to want to miss what I have in store for you! 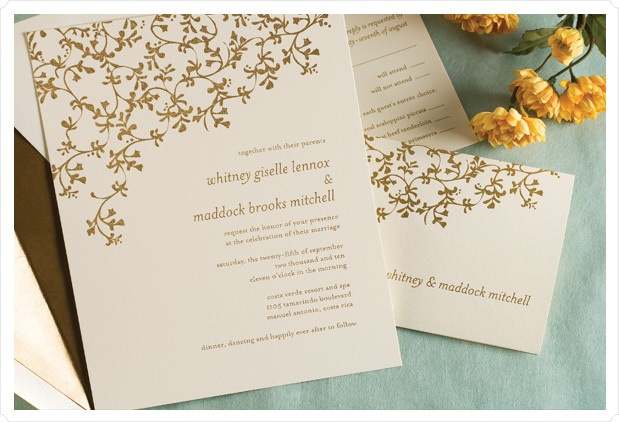 For many couples, the invitation suite is just as important as any other design aspect of their wedding. Unfortunately, the world of stationery can be a bit mysterious and frustrating, especially if you don't know what you're getting into. This week we'll take a look at the four most popular printing techniques for wedding/party invitations. I will outline the process of each and give a few tips about design and cost. Quantity, design choice, paper selections and printing technique are the main factors when determining cost. Price can also vary greatly between designers, especially now that invitation trends have moved in the direction of combining beauty with functionality. Your invitation suite will be like a little work of art and will give your guests their first taste of the wonderful day to come. 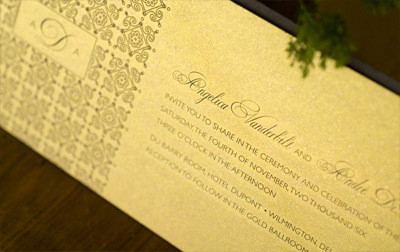 Engraved invitations will give the most traditional look. It has also been a staple in wedding stationery for decades. Abby Jean and Louella Press are my two of my favorites. So beautiful I can't stand it! Exquisite lines and decadent detailing, one look and it's love! The process is fairly labor intensive and is largely done by hand. Engravers etch lettering into metal plates. Ink is sunk into the depressions in the plates and loaded into a specialized printing press. The paper is pressed into the plate and the ink sits on the surface, creating the raised lettering. Engraving's signature feature is the bruising that occurs, like a halo around the lettering on the paper. This is a desirable effect and speaks to the beauty of the overall look. The bruise is caused as the paper is pressed against the plate. Inks used for engraving are opaque and unique to the process. An array of colors are available including white and a number of metallic colors. 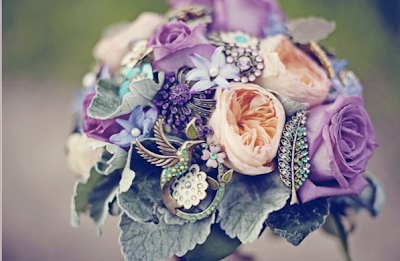 For the bride looking for a twist on tradition, try printing bold, vibrant colors on darker stock. Now for the bad news. Engraving, while beautiful is very costly (sad!). In nearly all cases, it is done completely by hand. Also, the pieces are put through the press once per color. So, the more colors you add, the more labor is required, and the pricier it gets. Budget conscious brides can make engraving more affordable by employing a few tricks. First, try to stick to one ink color, but make a statement. Use something like gold on red paper, white on green. Second, if you must have that incredible multi-color design, save it for the most important pieces (the invite card itself or the save the date). The reply card comes back to you anyway, so look for the savings. Get ready for a long turnaround, typically 4 to 6 weeks (expect 8 weeks during the high traffic months of April-August). Some designers can get it back faster, but not by much. 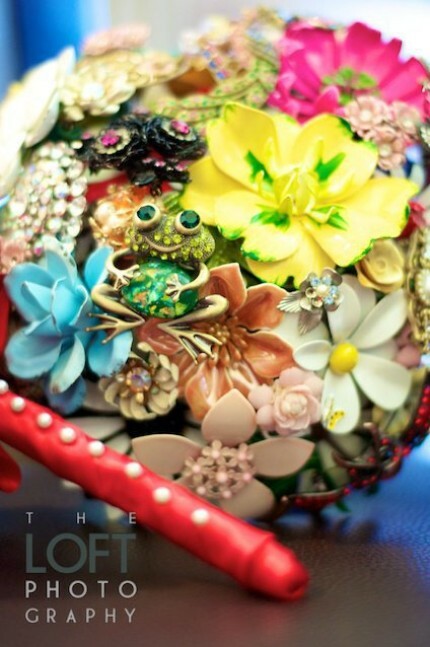 This is the totally gorgeous Treasury invite from Louella Press. Hello, beautiful! In the last few days, I've received numerous e-mails about the same topic: invitations. So, rather than do an In the Trenches round-up post, I thought I'd re-post (and break up) an older piece of mine about this topic. Over the next few days, I'll answer some questions about invites and all that comes with them. I am LOVING this adorable Carnival party I found. I was passing through Preston Bailey's fantastical wonderland of a blog and I found this! Sooo, cute! I really hope I get the chance to work on more kids' parties. Seriously! Who wouldn't want to spend their time dreaming up fantastic playlands for the littles? I hope you'll move it on over to the comments and share some of your favorite childhood party memories! So? What do you think...? Here it is! My new banner displaying my fantastic new logo! Don't you just adore? I'm so happy. This moment has been 8 months in the making and I still have so many new things to share with you! I hope you'll join me! A big thanks to Miss Allison for her unwavering support in this endeavor. I have a serious crush on my new logo! So, adoption is something that wasn't much on my mind when I was little. My parents were honest with me about the process and the concept as a child, so it never really crossed my mind in any significant way. It made me feel special, like I was someone my parents chose to love. Out of all the other little souls out there, my parents chose me. That's how I felt. Some of those feelings changed when I started school. I have been told how to feel. I have been ridiculed. I have been ashamed to be adopted. I have been ashamed to be myself. I promised myself, after a particularly ugly moment in 3rd grade, I would never be ashamed again. Fast forward 15 or so years. I'm great. My life is great. My family is great. The reality of adoption never crosses my mind until I need a bio fam for something. Medical records? I don't know. I'm adopted. The realization that, hey I am a biracial person in a modern world? Oh, yeah. I'm adopted. All the life I have and part of my identity is wrapped up in the fact that I am adopted. Today I read a blog (a comment on teen parenting) that led me to another blog (written by a bio mom), that had a post that for whatever reason, brought back all those awful, unhealthy feelings. And do you know what I did? I flipped. I completely lost any composure, or sensitivity or, common sense. I fired back a response so quick, I didn't even stop to think about what I was saying, or more importantly, how I was saying it. What a maroon, huh? Well, it gets worse. When she replied, a reply that I totally deserved, instead of fully getting the hint, I fired back with more ignorance, anger and stupidity...only I didn't just come out and say it, I sort of sarcastic-ed it in there. To which she kind of flipped, justifiably. So, I apologized. Finally. Probably not very well or very elegantly, but I apologized. I am appalled at how I handled the situation. I also didn't know that using an alias was a bad thing. Some of the other blogs I frequent have them, so I thought it was generally okay (now I know, not so much...) Needless to say, I took a chance to learn from someone with something very important to teach and royally cocked it up. If she were here now, I would tell her how sorry I am and properly this time. The way I was taught to apologize to someone I have wronged. I would apologize for attacking her in her own space. I would tell her that even though I reacted badly, the experience has taught me a lot about her side of the issue. I would also tell her that even though my head knows adoption isn't perfect and needs reform, my heart can't believe it. My heart needs all those families out there to find their own little souls to love. My heart needs happy endings. My heart needs happily open adoptions as well as happily closed ones. That even with everything I know, my heart just isn't ready. My story does not dismiss your story nor does your story make adoption full of butterflies and rainbows. There is room enough for both of us. She's right, you know. And hopefully someday, when I can check my privilege at the door, there will be.